Lucy is a part of the 2017 graduating class at Uhuru Academy. She has three siblings, Martha, Jane, and James. Her family is from Naivasha, and she lives with her parents. She would like to become a neurosurgeon because she wants to know what the brain looks like. She is always happy and is constantly smiling! Lucy says the best things about Uhuru Academy are the academics and the facilities. She likes that the teachers are cooperative and understanding, and the facilities are comfortable. She believes that education is the key to success. According to Lucy, if you are not highly educated, you cannot find a job that provides money. Getting an education allows her to provide for her needs and help others. 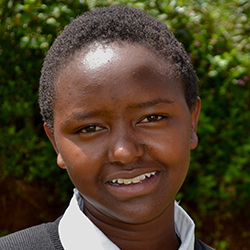 Click here to sponsor a student like Lucy.